1. Preheat the oven to 130°C, gas mark 1. Heat the oil, apple juice and maple syrup together in a large pan over a low-medium heat, stirring to dissolve the syrup. Remove from the heat and add the remaining ingredients, reserving the raisins and the coconut. Using a spatula, combine all of the ingredients well. 2. Spread this mixture evenly over a baking tray lined with parchment paper. Place the tray in the oven for approximately 70 minutes, stirring the mixture frequently, until golden brown. Remove the tray from the oven and allow to cool slightly, breaking any clumps. Once cool, add the raisins and coconut. Store in an airtight container. 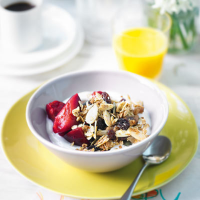 When ready to serve, pour the granola in a bowl and serve with your favourite yogurt or milk, and the reserved plums from the Plum Fizz recipe, if you wish.